Inside greeting – God bless you with His love and peace at Christmas and always! Inside greeting – …and His light changed the world forever! God bless you with His love and light at Christmas and always! The back of the card includes the following: Micah 5:2 But you, Bethlehem Ephrathah, though you are little among the thousands of Judah, from you One will go forth for Me to be ruler in Israel. His goings forth are from of old, from everlasting. Luke 2:4-7 And Joseph also went up from Galilee out of the city of Nazareth into Judea to the city of David, which is called Bethlehem, because he was of the house and lineage of David, to be taxed with Mary his espoused wife, who was great with child. While they were there, the days were completed for her to give birth. And she brought forth her firstborn son and wrapped him in swaddling clothes and laid him in a manger, because there was no room for them in the inn. Titus 3:4-7 But when the kindness of God our Savior and His love for mankind appeared, He saved us, not on the basis of our righteous deeds, but according to His mercy, by the washing of regeneration and renewing by the Holy Spirit whom He poured out upon us abundantly through Jesus Christ our Savior, that being justified by His grace, we should be made heirs according to the hope of eternal life. 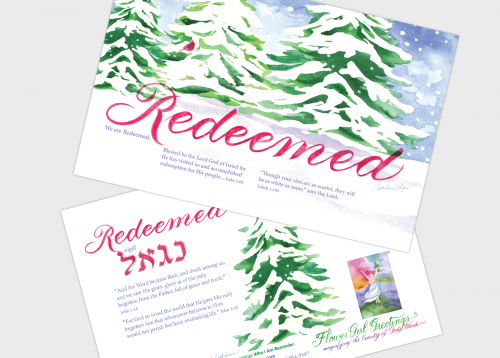 Card front – I know that my Redeemer lives! Inside greeting – May you know the depth of His love for you at Christmas and in the new year! Card front – “O come let us adore Him!” plus a photograph of the artist’s nativity! Inside greeting – May you know the depth of His love for you at Christmas and always! The back of the card includes the words to the following hymn along with the story of the artist’s nativity. O Come All Ye Faithful John Francis Wade’s Cantus Diversi, 1751 O Come, all ye faithful, Joyful and triumphant, O come ye, O come ye to Bethlehem. Come and behold Him, Born the King of angels! O come, let us adore Him, O come, let us adore Him, O come, let us adore Him, Christ, the Lord! O sing, choirs of angels, Sing in exultation! O sing, all ye citizens of heaven above! Glory to God, all Glory in the highest! O come, let us adore Him, O come, let us adore Him, O come, let us adore Him, Christ, the Lord! Yea, Lord, we greet Thee, Born this happy morning, O Jesus, to Thee be all glory given; Word of the Father, Now in flesh appearing! O come, let us adore Him, O come, let us adore Him, O come, let us adore Him, Christ, the Lord! This nativity began years ago with a gift of small figures. We would gather around it with neighborhood children to read the Christmas story and celebrate the birth of Jesus. At the brief mention that more sheep were needed for the pasture, offerings from family and friends began to arrive. As the number of sheep grew, so did the pastures, shepherds, and trees. The many sheep remind us that we are all unique and cherished in His sight. Give this card to celebrate our Lord’s birth or to encourage a steadfast heart. Joseph and Mary took the Child Jesus to Jerusalem after His birth to present Him to the Lord. Simeon, a devout man who was looking for the consolation of Israel came in the Spirit into the temple where they were. It had been revealed to him by the Holy Spirit that he would not see death before he had seen the Lord’s Messiah. At that very moment, there was also a prophetess in the temple, Anna the daughter of Phanuel, of the tribe of Asher. She was very old and had lived with her husband seven years after her marriage and then as a widow to the age of eighty-four. She never left the temple, serving night and day with fastings and prayers. The original artwork for this greeting card was created with charcoal and pastels. The blue hues of Anna’s garment reflect her inner tranquility in the Holy Spirit Who enabled her to recognize the Child as the Lord’s Anointed One. After Jesus’ birth, Joseph and Mary took Him to the temple in Jerusalem to present Him to the Lord. There was a righteous and devout man in Jerusalem named Simeon who was looking for the consolation of Israel, and the Holy Spirit was upon him. It had been revealed to him by the Holy Spirit that he would not see death before he had seen the Lord’s Messiah. The original artwork for this greeting card was created with charcoal and pastels. The fiery colors represent the Holy Spirit Who enabled Simeon to recognize the Child as the Lord’s Anointed One.